Two years ago we were searching for a church as a family that we would all be able to get plugged into. 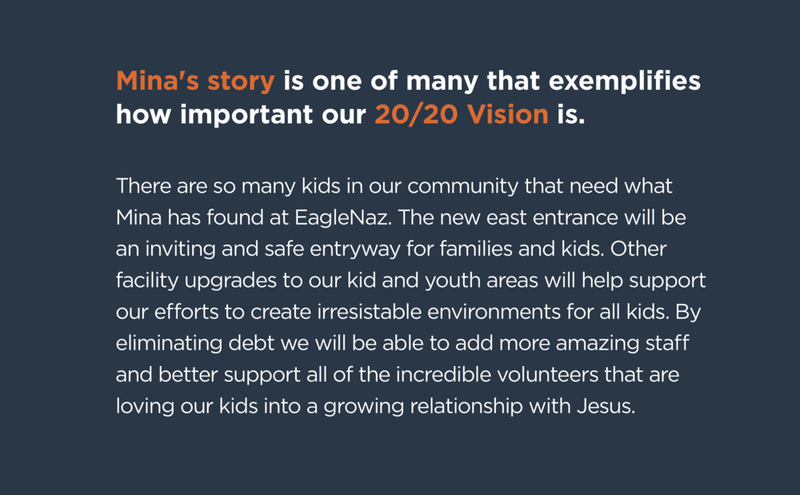 Jake suggested that we try EagleNaz because he had come a couple times with some friends from school. The first Sunday that we came we thought we would all sit together and just kind of check the place out. I knew Jake was going to like EagleNaz and Rob and I felt comfortable trying another church. But Mina had never been one who really enjoyed going to church on Sunday mornings. Before, mina would sometimes reluctantly go to Sunday school. So, we thought the first Sunday we would take her upstairs and just walk around Kid Ministry so she could see what it was about, who the teachers were, and hopefully that would make her feel more comfortable if we ever wanted to come again in the future. When we took Mina upstairs we introduced her to Miss Julie and she was immediately whisked away and she ended up staying there with the kids for the entire service! I was surprised that she decided to stay but I was excited that she wanted to try something new. Mina has grown so much here. She is surrounded by leaders that love her and take care of her. She wants to spend as much time here as she can. She would go to both services every Sunday if we let her! She loves her special Bible that Miss Nancy made for her with her name on it. When she comes here she just feels so encouraged and loved and it’s where she wants to be every Sunday...today, tomorrow and forever!"